I had some leftover fresh dill from the yogurt-dill dip I made last weekend so I decided to use it with chicken for dinner tonight. The results were great and Jon really loved this one. I'll be putting it on the list of things to make again. Heat 3 tbsp butter and the olive oil in a large saute pan. Dredge chicken in flour, shake off excess, and put in the hot pan. Cook for 3-4 minutes on each side until golden brown (longer for thicker breasts). Remove to a dish and keep covered. Add garlic and shallots to the pan and stir, scraping up the brown bits from the chicken. Add the chicken broth, lemon juice, and dill. Bring to a simmer. Return chicken to the pan and cook on medium for 5 minutes. Remove chicken again and keep warm. Add butter to the pan and whisk until creamy. Pour sauce over the chicken. I think I may try adding just a touch of light cream at the end next time for a different texture, but even with just the butter this sauce was very creamy. 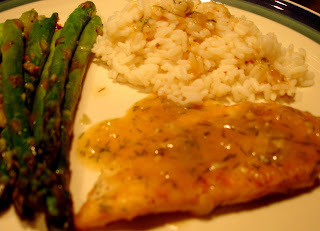 I served the chicken with rice and roasted asparagus. Tonight I used salt, pepper, 3 cloves minced garlic, and olive oil on the asparagus. Dad's Birthday Dinner - Lots of Delicious Food!